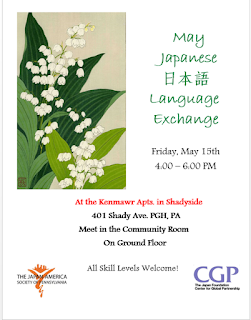 PennsylvAsia: Japanese language exchange at Kenmawr Apartments, May 15. Japanese language exchange at Kenmawr Apartments, May 15. Join us for JASP's fourth language mixer! The language mixer will be held on Friday, May 15th from 4:00 to 6:00 pm at the Kenmawr Apartments. Kenmawr Apartments is right off the B route for CMU students and off the 71B PAT Bus route for Pitt students. 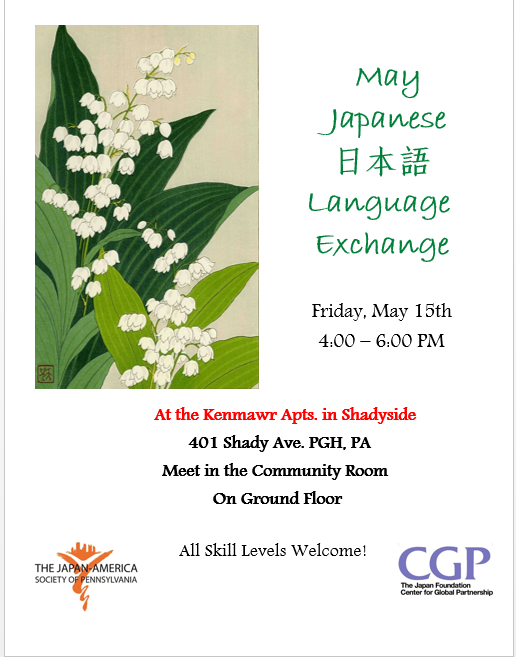 The mixer is always a good chance to learn more about the Japanese language and connect with Pittsburgh's Japanese community. The flowers in the poster is a suzuran, or lily of the valley, the birth flower of May. The apartment complex at 401 Shady Ave. (map) has a large number of Japanese residents who work and study in the city, and often hosts cultural events for its international residents. Friday's event runs from 4 to 6 pm.